When you choose a new fence for your home, durability and longevity are often among the top components that homeowners look for. The next component is style, and that’s where it can get tricky. However, at Ware Fencing, we have the perfect combination of style and strength with our custom brick fence columns in Crowley and Fort Worth, TX and the surrounding areas. Our team can make your fence stronger and more beautiful with brick and stone supporting accents. To learn more about our stone and brick column services, call us at 817-948-4503 and speak with one of our fencing professionals to schedule your appointment and quote. As we said before, we have the perfect combination of style and strength to offer our clients. Whether you have a commercial or residential property, you can benefit from the increase in protection, longevity, and property value that a custom fence with stone or brick supports can offer. Some clients prefer a wood fence with brick columns, and other clients prefer an iron fence with brick columns or even stone columns. No matter which you prefer, our expert contractors can make your vision a reality. 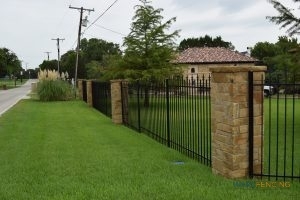 Brick and stone are better than traditional fence materials in that they require very little, to no maintenance at all. A thorough pressure was every couple of years can do wonders in keeping it looking like new, but some clients actually prefer the aged aesthetic. The areas of your fence that are not stone or brick, however, will still need maintenance, so we typically recommend likewise low-maintenance options such as wrought iron or even aluminum to be paired with these types of columns. This is because wood fences have a significantly shorter lifespan than brick or rock, which can be frustrating for the home or property owner. At Ware Fencing, we are dedicated to providing our clients with high-quality materials and craftsmanship in everything we do. 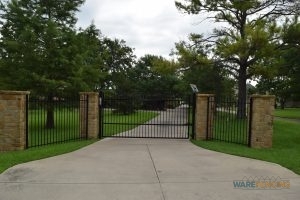 We are specialists in fence installations, as well as fence repairs and replacements, and we have been servicing fences in North Texas for many years. When you need exceptionally reliable rock or brick fence columns in Crowley and Fort Worth, TX or the surrounding areas, give us a call at 817-948-4503 and speak to one of our specialists. We also offer a variety of other fence and stone services, so ask us which options are best for your needs and budget! Updated on September 20, 2018 at 9:09 am by Ware Fencing.